Everything is getting more complex. It is easy to be overwhelmed by the amount of information we encounter each day. Whether at work, at school, or in our personal endeavors, there's a deepening (and inescapable) need for people to work with and understand information. Information architecture is the way that we arrange the parts of something to make it understandable as a whole. When we make things for others to use, the architecture of information that we choose greatly affects our ability to deliver our intended message to our users. We all face messes made of information and people. I define the word "mess" the same way that most dictionaries do: "A situation where the interactions between people and information are confusing or full of difficulties." - Who doesn't bump up against messes made of information and people every day? 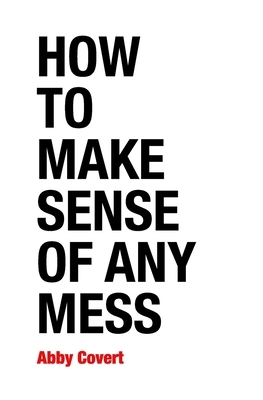 This book provides a seven step process for making sense of any mess. Each chapter contains a set of lessons as well as workbook exercises architected to help you to work through your own mess. Abby Covert specializes in delivering a highly collaborative information architecture process and teaching those that she works with along the way. Abby speaks and writes under the pseudonym Abby the IA, focusing on sharing information architecture content with those working within the design and technology communities. She teaches information architecture at The School of Visual Arts, Parsons: the New School and General Assembly NYC. Abby prides herself on being an active organizer and mentor within the IA community. She currently serves as the president of the Information Architecture Institute and as an advisor for the Information Architecture Summit. She holds credit for inventing World Information Architecture Day, a free annual conference held simultaneously in dozens of locations across the globe. Now in its fourth year, World IA Day has been held in 50+ cites. Thirty eight more locations have been added for 2015. After ten years of practicing information architecture for clients and writing about it on the web, Abby saw that too few people knew how to practice it for themselves. She decided that the best way to help would be to teach this important practice. And, after two years of teaching without a textbook, Abby told her students that she intended to write the book that was missing: a book about information architecture for everybody. This is that book. In developing this book, Abby wrote more than 75,000 words, clarified the contextual meaning of more than 100 terms, and tested three distinctively different prototypes with readers.